Genoa has beaten Parma by 3-1 and climbed to the shared 10th postion in the standings with 27 points. Man of the match was Parma-defender Paletta. First Paletta fouled Floro Flores in the penaltyarea, the penalty was realized by Rodrigo Palacio. After Hernan Crespo scored the equalizer it was Paletta who headed the ball in his own goal and gave Genoa the lead again: 2-1. A few minutes later Palleta blocked a shot of Marco Rossi only half, so Kaka Kaladze could score the last goal: 3-1. With Genoa striker Alberto Paloschi made his debut and Abdoulay Konko played his first match in Luigi Ferraris after 2 1/2 years with Sevillia. 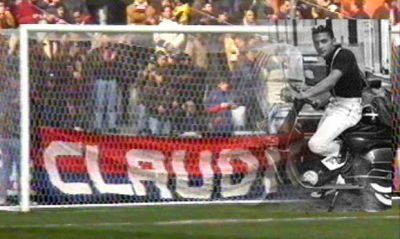 Today 16 years ago Claudio Spagnolo was killed by Milan-fans. Rest In Peace Spagna ! Again a goalless draw today. Genoa started with Floro Flores in the line-up, but it was clear that the ex-striker of Udinese did not play much the last time. The biggest chances were missed by Marco Rossi and Bosko Jankovic, while Chievo played the last 22 minutes with 10 players after the red card of Cesar. Genoa is now on the 14th position in the standings. Next Sunday we play against Parma in Luigi Ferraris. Derby Wednesday 16 February; Konko is back! Last Wednesday Sampdoria beat Udinese after penalties in the Coppa Italia, which means that they play the quarter-finals against A.C. Milan next Wednesday and the derby will be played on Wednesday-evening 16th February. Genoa is happy because now all our new arrivals like Boselli, Antonelli, Paloschi, Konko (see foto below) and maybe also Marchetti and Zé Eduardo can play the derby. This afternoon our President Mr. Enrico Preziosi gave an emotional press-conference. He admitted that he made some mistakes with the transfers last summer (Toni, Zuculini, Eduardo), but the critics of the journalists and a little part of the fans of Genoa against him and his family are too heavy at the moment. If things don’t turn into a normal situation Preziosi threathed that he will sell Genoa at the end of this season. At the end of the conference Preziosi officialized the departure of Giuseppe (Beppe) Sculli towards Lazio today. Our striker is immediately substituted by Antonio Floro Flores (Udinese) who already trained with Genoa this afternoon. Next Thursday also our ex-midfieldplayer Abdoulay Konko returns from Sevillia to Genoa. In the summer of 2008 Konko was sold for € 9 million to Sevillia, now after 2 1/2 years he returns with Genoa and Preziosi has to pay only € 6 million back now. Another financially good deal! Finally the goals returned in Luigi Ferraris. Genoa played a good match for 75 minutes, especially offensively. The defense without Dainelli (and the sold Ranocchia) did not show that they were the best defense of Serie A till today. Goalkeeper Eduardo failed at the second and fourth goal and Chico at the first goal. 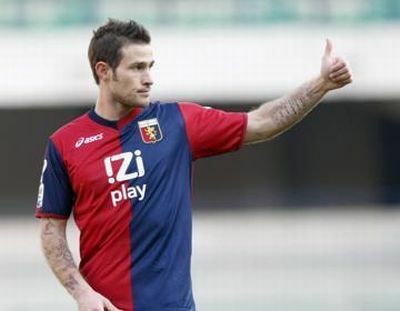 The goals of Genoa were scored by Omar Milanetto (1-1 in the 45th minute) and Mattia Destro (2-2 in the 58th minute). With a delay of 24 hours because of his injury Genoa decided at the end to hire Mauro Boselli the rest of the season of Wigan. In July Genoa can buy the striker who won 2 times the Coppa Libertadores (South American Champions League) from which he was also topscorer with 8 goals. The price is already fixed on € 7 million. Because of the injury we have to wait till the end of the month (derby ?!) before Mauro can play his first match with Genoa. In the meanwhile Gergely Rudolf is rented to Bari for the rest of the season to have more playtime in Serie A and return more experienced next season. Today was also the official presentation of Luca Antonelli (Parma ) and Juraj Kucka (Sparta Prague). The Slovacchian already played yesterday with Genoa in San Siro against Inter. Antonelli is injured and can probably play at the end of January (like Boselli). 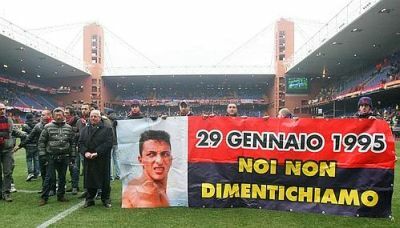 Tonight Genoa lost 3-2 in San Siro against Inter in the 1/8 finals of Coppa Italia. The 2 goals were scored by Kharja (penalty) and Sculli, both in the 2nd half in which Genoa played a lot better than before the break. Man of the match was Samuel Eto’o who scored twice before halftime. Our ex-defender Andrea Ranocchia should be sent off with a red card after his irregular stop of Rudolf. Besides the penalty it also should be red. Yesterday-evening it was big news everywhere in the world: Genoa bought two Argentinian strikers with the name Mauro: Boselli and Formica. Now 24 hours later both transfers failed in the last minute. Formica yesterday already left the trainingscamp of Newell’s Old Boys in Argentina and was on his way to the airport to fly to Genova when at the last minute the transfer failed because Genoa wanted to pay the transfersum after the medical test and Newell’s wanted Genoa to pay before Formica left Argentina. At the same time Genoa agreed with Wigan (Premier League, England) of hirering striker Mauro Boselli the rest of this season with an option to buy him this summer. This afternoon Boselli already arrived in Genova to have his medical test and to sign the contract to be in time to play against Udinese next Sunday. Unfortunately Boselli did not pass the medical test, so also this transfer failed at the last minute. Hopefully the new striker(s) will arrive soon, because in 4 days we play against Udinese.